Thanks. i don't see the schematic in this pdf. - The FDC write-precompensation setting is quite aggressive which make the pulses capture not working properly. Is there a way to change this parameter ? Edited by Jeff_HxC2001, Wed May 9, 2018 2:32 PM. I can tweak the capture routines to make it work but i don't have this FDC here to test the modifications. BTW is normal writing working fine on HD disk with this controller ? no, what i ask is : have you already tried to write files with this controller and the "lotharek" emulator on HD images ? yes I get an error writing to the hfe i formatted earlier. This is the MAME log for the HDC9234 with active LOG_WRITE and LOG_FORMAT. HFDC schematics should be on WHT if not I can upload. Just checked with the HDC specs: The dump indicates that there is no precompensation. - Raw Kryoflux stream files. And this is the same software used by arcadeshopper ? I did this using the settings on a version of the HxC tool I downloaded in April. In the first picture you see the settings, other settings I used error-ed after format. Then when I used these settings the second picture shows the outcome. I am including that format here now, this was formatted on a HxC, though I tried a Gotek on the first couple of attempts, with other settings.. I worked after I came in from working on one of my trucks, then from 8:30ish to 11:30ish I used my newly repaired Geneve to run the tests. In the Geneve picture, the bad sectors could be attributed to a problem I encountered with the HxC, It is not mounted, just laying there and the thing stopped being lit up for a bit, while verifying, maybe a bad power cable connection, and I had to reload the image as a disk on the HxC, while the verification process was working. Here's some of mine from a Corcomp. - these are from the ones I linked to above - empties that are around 981K but formatted differently. Not sure how they were created. - These, I reformatted with my Corcomp controller with DM2K. They appear to have formatted correctly, but if you want to check the layout, feel free. - This is an attempt to use CopyC to copy from a protected DSK3 disk (MG Explorer) to a SSSD Formatted HFE (from above). Obviously, it didn't like it. I used a Sandisk Class 10 Ultra 16GB micro SD card in the GoTek for this; this unit has some pretty nice write speeds. Thanks for your tests, all images are fine so far, as I tested them with my AnalyseHFE tool. The copy-c sample shows DDAMs (deleted DAMs). However, my actual intention was to verify the behavior of the HFDC, so I really need a disk that was formatted and written by a HFDC. Well, that disk is on its way to Jonathan so maybe late this weekend he will have the disk. I did go digging into MDOS looking at the HFDC format routine. From what I can tell, it actually uses code on the HFDC eprom itself, rather than separate code. 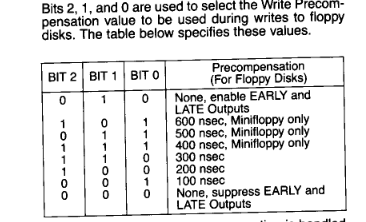 So, it should not matter whether the disk is formatted from MDOS on a Geneve, or on a TI-99/4A. They should be the same. Michael, look at the HxC program setting pic I posted and let me know of some values that you think need to be readjusted, to get a better format, such as side based is checked. Unchecked kept giving device or media errors when formatting. Also I can do all the different formats tonight, since I can use my Geneve and HFDC together again. The disk should be 40 track, double density, 250 kbit/s, 18 sectors/track. This means a total of 1440 sectors. Interleave is 4, skew is 0, but what is side-based? Don't know, maybe whether this is depending on the side, then I'd say not. Also, pre-gap length may refer to the sync zone, which is 12. Auto-gap3 is OK; we do not rely on exact gap lengths. By the way, I wonder how you manage to format a disk with 1.4 MiB size with 250 kbit/s only. This must be 500 kbit/s. The reason is that with 36 sectors per track, and each having 256 byte, plus some more for headers and gaps (typically plus 84), and 16 cells per byte, you get about 200000 cells per track, and a track is exactly 0.2 seconds long (with 300 rpm), so every cell must be 1 us, or, taking again 2 cells for each data bit, both require 2 us, which is 500 kbit/s. Okay I'll be sure to get one to those specs, I don't know why it worked but it did, though it took awhile to verify. It took a while to verify because of your interleave/interlace set at 1. Needs to be around a setting of 4 to cut down on the number of revolutions the disk would need to make. The only time I would ever use an interlace of 1 on a Geneve would be if I was booting from floppy and had a skew setting of something like 3. In that one and only use, you are loading MDOS as fast as the disk turns. Once you get the overhead of MDOS, then it can no longer read in a disk that fast. I figured that was it, it's been a long time since I messed with that type of stuff. Are you trying to format on a Gotek or HxC? Mine was done on the HxC.